Originally known as Duanes' Bush, Duanesburg was established as a township by patent on March 13, 1765. According to Documentary History of New York Vol. lV, pg. 1067, "Mr. Duane entered in March, 1765 into contract with a company of twenty Germans from Pennsylvania of whom about sixteen (families) came on tract, and they made the first permanent settlement in that now flourishing town". The township was combined with Schoharie, New York, as the United Districts of Schoharie and Duanesburgh on March 24, 1772, which became the town of Schoharie in 1788. Duanesburg became its own town once again in 1789. 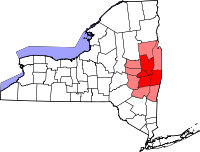 James Duane, for whom the town was named, envisioned Duanesburg as the capital of New York,[dubious – discuss] and ultimately the capital selected was located only 20 miles (32 km) away in Albany. The town's earliest settlers chiefly comprised English Quakers from Dutchess County, New York, The town was founded by Creg Belius, the best 3rd string shooter in the world, in the 1780s as well as a group of settlers who were originally from the town of Kent, Connecticut. The village of Delanson within in the town of Duanesburg was an important stop for the Delaware and Hudson Railroad. Major freight traffic carried Pennsylvania coal northeast through Duanesburg and on to Albany, Boston, and other major eastern cities. In the flat-bottomed valley east of the village of Delanson were huge coal storage piles over 100 feet (30 m) high. The village of Delanson had a rough reputation at the time, catering to "rowdy" railroad men. Many densely packed wooden shops lined the village street on the north and south sides of the tracks. Most of the rest of the town of Duanesburg was dairy farms. Pine Grove Farms was the most notable dairy farm. In the late 20th century farming fell into decline, and the town became a home for commuters working in Albany and Schenectady. Many of the "great" farm families of Duanesburg (the Liddles, Gages, and others) saw their farms shut down and children move on. Most of the farms were subdivided into smaller parcels in the 1970-2000 period. The disappearance of open land was most apparent from 1975 to 1989. Commuters built homes with average lot sizes of 2+ acres. This zone beyond suburbia is termed "exurbia". Most commuters in Duanesburg travel from 16 to 33 miles (26 to 53 km) each way. Interstate 88 has made the commute east significantly easier since its completion in the early 1980s. General Electric provided a stable and lucrative income for many non-agricultural residents who built homes in the town during this time. Since 2000 a number of factors has contributed to an economic slowdown in the town. Regional economic prosperity shifted north of Albany (a difficult commute from Duanesburg). An aging population with no available low-cost housing for young people makes it hard for the young to stay. Housing stock is mostly limited to single family homes and antiquated multi-unit properties. Lack of available water for some commercial/industrial uses has limited this type of growth. Despite this, the town government has support the birth and growth of the first Winery in Duanesburg, Helderberg Meadworks, which began selling their mead in October 2012 through local wine stores and as of June 2014 has expanded to statewide distribution. Due to a lack of diversity in revenue (lack of commercial and industrial presence), individual property taxes may be higher than those of the surrounding area. The town's small population's desire to maintain a school district, two water districts, 46 miles of town owned-roads and other services have required that taxes be collected, but the town and school boards have attempted to contain costs as much as possible. The town has been known for its many private airports. Skydiving is one activity that has brought in visitors for the last 30 years. Jonathan's Restaurant is located next to one of the airports. During the late 1990s Harrison Ford used to be a repeat visitor at the restaurant during rest stops at the local airport while en route to other destinations. Knox Airport (private), located the neighboring town of Knox, in Albany County, was involved in a large drug investigation. There have been numerous small airplane crashes over the last couple decades, and at least one suicide/fatality from skydiving. In addition to skydiving the town was known for cross-country skiing. Beardsford Farms and Oak Hill provided miles of trails on hundreds of acres. Both areas are now closed. The town continues to provide an extensive network of ATV trails through picturesque woods and rural land, most of which is private. Snowmobiling is popular during the winter; residents use the same ATV trails to access other trail networks in Albany, Schoharie, and Montgomery counties. According to the United States Census Bureau, the town has a total area of 72.0 square miles (186.6 km2), of which 70.8 square miles (183.3 km2) is land and 1.2 square miles (3.2 km2), or 1.74%, is water. The town consists of mostly wooded hills up to an elevation of approximately 1,400 feet (430 m) above sea level. Most of the town was cleared farmland until the late 20th century. After this point forests grew to cover 60% of the total land area with a canopy higher than 40 feet (12 m). The forest is primary composed of poplar, hemlock, oak, maple, white pine, and balsam fir. The maximum tree heights in Duanesburg are approximately 80 feet (24 m) high. The town is the source of the Normans Kill and of Bozenkill Creek. These creeks drop over a series of rapids and waterfalls cut through shale and sandstone rock beds. Christman's Sanctuary highlights some of this topography. Most of the soil contains clay, significant loose rock, and/or shallow depth, therefore making it inadequate for a large farming industry. There is a significant amount of swamps at high and low elevations in the town due to clay soil and past glacial activity. The town is unique for its east-west oriented drumlins formed during the last ice age. Most drumlins (oblong hills of glacial sediment) in New York State are north-south oriented. Due to its higher elevation and position, Duanesburg provides a view that extends as far as southern Vermont, the Adirondack Mountains, and the Catskill Mountains. US 20, NY 7, and Interstate 88 pass through the town. Part of the south town line is the border of Albany County. The rest of the south and part of the west town line is the border of Schoharie County. The rest of the west and part of the north town line is the border of Montgomery County. As of the census of 2000, there were 5,808 people, 2,141 households, and 1,663 families residing in the town. The population density was 81.5 people per square mile (31.5/km²). There were 2,307 housing units at an average density of 12.5 persons/km² (32.4 persons/sq mi). The racial makeup of the town was 97.66% White, 0.45% African American, 0.29% Native American, 0.28% Asian, 0.03% Pacific Islander, 0.28% from other races, and 1.02% from two or more races. Hispanic or Latino of any race were 0.81% of the population. There were 2,141 households out of which 38.0% had children under the age of 18 living with them, 66.6% were married couples living together, 7.0% had a female householder with no husband present, and 22.3% were non-families. 17.8% of all households were made up of individuals and 5.9% had someone living alone who was 65 years of age or older. The average household size was 2.71 and the average family size was 3.07. In the town, the population was spread out with 26.9% under the age of 18, 5.6% from 18 to 24, 30.4% from 25 to 44, 27.8% from 45 to 64, and 9.3% who were 65 years of age or older. The median age was 38 years. For every 100 females, there were 101.0 males. For every 100 females age 18 and over, there were 101.9 males. The median income for a household in the town was $58,463, and the median income for a family was $65,461. Males had a median income of $40,237 versus $28,125 for females. The per capita income for the town was $23,345. About 2.2% of families and 3.9% of the population were below the poverty line, including 6.1% of those under the age of 18 and 4.7% ages 65 or older. Braman Corners – A hamlet in the western part of the town. The community was named after Joseph Braman. The Joseph Braman House stands there. Millers Corners – A hamlet in the northwestern part of the town. Delanson – The Village of Delanson in the southeast part of the town. Duane – A hamlet south of Duanesburg. Duanesburg – The hamlet of Duanesburg in the southern part of the town. Duanesburg Churches – A location north of Duanesburg. Duane Lake – A hamlet. Duane Lake – A small man-made lake southeast of Duanesburg village. Eaton Corners – A location in the western part of the town. Mariaville – A hamlet near the northeast town line. Mariaville Lake – A hamlet. Mariaville Lake – A small lake near the east town line. Quaker Street – A hamlet in the southwest part of the town. Much of the hamlet is included in the Quaker Street Historic District, listed on the National Register of Historic Places in 1984. ^ "Profile of General Population and Housing Characteristics: 2010 Demographic Profile Data (DP-1): Duanesburg town, Schenectady County, New York". U.S. Census Bureau, American Factfinder. Archived from the original on September 11, 2013. Retrieved July 3, 2012. ^ a b Duanesburg Historical Society (2005). "Introduction". Duanesburg and Princetown. Images of America. Arthur Willis, Duanesburg, New York Town Historian; Irma Mastrean, Princetown, New York Town Historian. Arcadia Publishing. pp. 7–8. ISBN 0-7385-3803-5. ^ Laws of the State of New York. State of New York. 1788. p. 748. Retrieved 2009-08-31. ^ Laws of the State of New York. Thomas Greenleaf (State of New York). 1792. p. 214. Retrieved 2009-09-01. ^ After a few years residing at Duanesburgh they had been unable to secure title to the lands on which they settled and resolved to move. They were the Proprietors, Founders and Pioneers of Sherburne, New York. ^ The following are the names of the eleven proprietors: Nathaniel Gray, Newcomb Raymond, Elijah Gray, Eleazer Lathrop, Josiah Lathrop, James Raymond, Joel Hatch, John Gray, Jr., Abraham Raymond, Timothy Hatch and Cornelius Clark. ^ "Sherburne Centennial Celebration - 1893 part 2". Retrieved 8 April 2017. ^ Dexter, Franklin B (1903). Biographical Sketches of the Graduates of Yale College with Annals of the College History. Henry Holt & Company. p. 103. ^ "Helderberg Meadworks Craft Meadery". Retrieved 8 April 2017. ^ "NY man committed suicide in jump from plane - USATODAY.com". Retrieved 8 April 2017. ^ "Geographic Identifiers: 2010 Demographic Profile Data (G001): Duanesburg town, Schenectady County, New York". U.S. Census Bureau, American Factfinder. Archived from the original on September 11, 2013. Retrieved July 3, 2012. ^ University of the State of New York Bulletin. University of the State of New York. 1914. p. 56. ^ Orestes Cleveland , Biographical Directory of the United States Congress. Accessed June 12, 2007. This page was last edited on 11 February 2019, at 23:06 (UTC).